Wow. There are just too many things to be thankful for. Too many, but I will try to highlight the big ones. * My family. I am so absolutely in love with my husband and three amazing kids. They don't usually run with me, but they let me run. And, they don't complain too much about the running shoes scattered throughout the house or the ickiness of my toes. *My friends. I am very glad to have some awesome people in my life. I appreciate all their kind words, messages and hugs. *My Virtual Running Buddies. 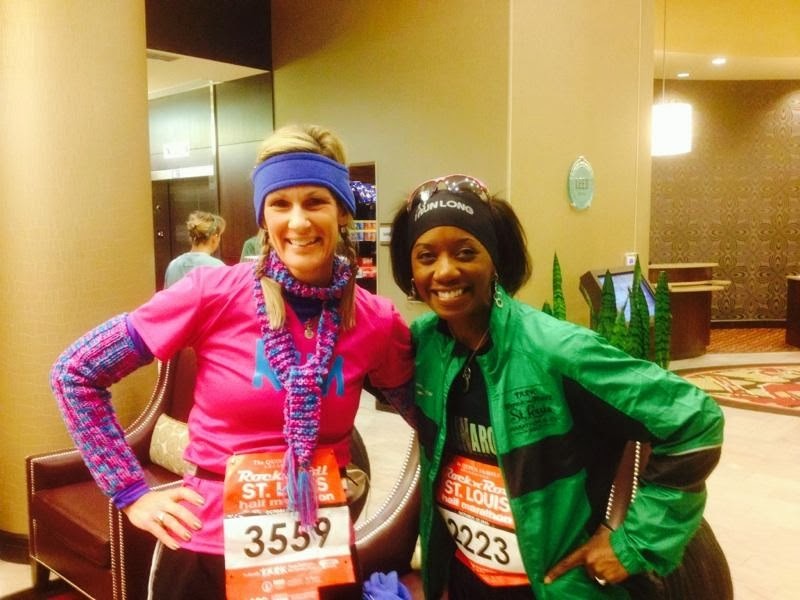 There are so many wonderful people who have become dear friends, and all of them came to me via my running page, Running On The Fly. There have been countless messages, well wishes, (virtual) high-5's, and many laughs shared through our computer screens. I love you all, and I look forward to meeting ALL of you in person someday. *The racing community. I don't consider myself a racer, but I love the atmosphere on race day. There's something about an entire bunch of strangers all running towards the same finish line that invigorates me. *The gift of running. 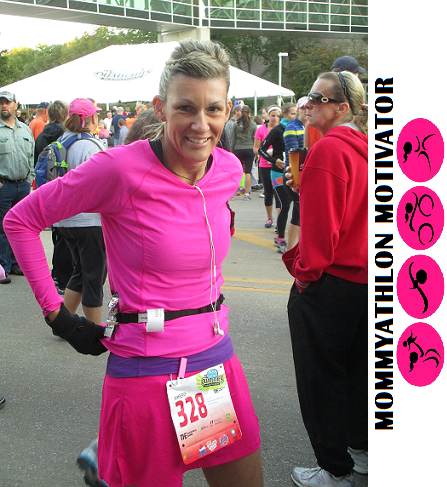 Having spent most of my life believing I was not an athlete, I am so humbled (and proud) to call myself not just a runner, but a marathoner! 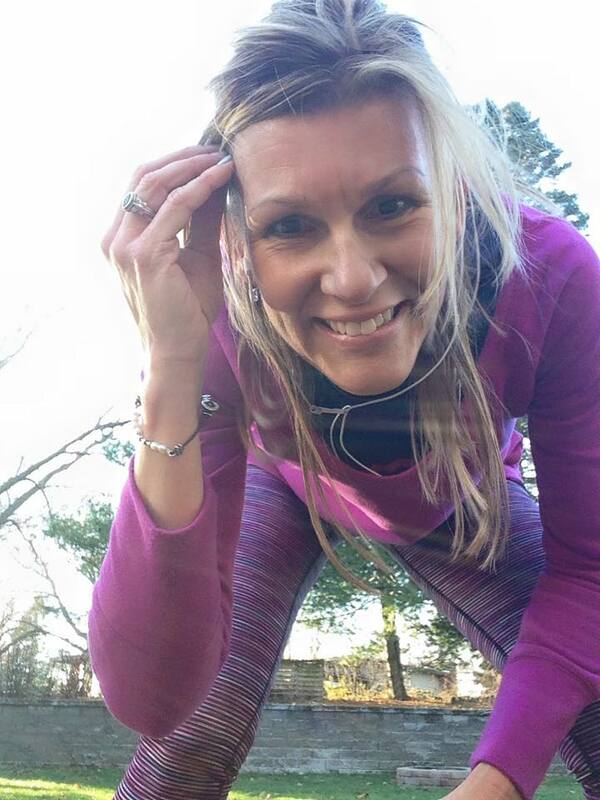 The mercury has been on a steady nose-dive recently, and my running doesn't stop for anything (well, unless I'm side-lined while in recovery from a running-related injury......but that's another blog for another time). 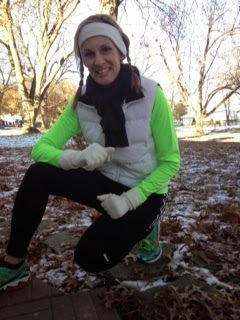 So, what happens when the temps plummet down to single digits and your body (and mental well being) are craving a run? Sure, you can fire up the treadmill (some runners have been known to use this strategy), but I much prefer the great outdoors. 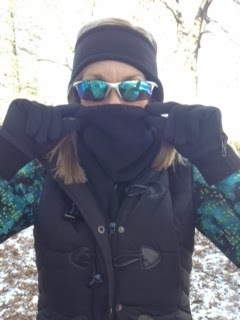 The great outdoors do turn a bit chilly this time of year, so here's some of my tried and true winter running survival tips. These require a slight change of wardrobe, flexibility in scheduling the runs, and a little bit of creative finesse doesn't hurt. Let's start from the head and work our way downward. Your head will need protection from the cold. I prefer a fleece headband, but any kind of cold weather head covering will work. Keep in mind, even though it's cold outside, your head will still be sweating so you should wear something that has moisture-wicking construction. 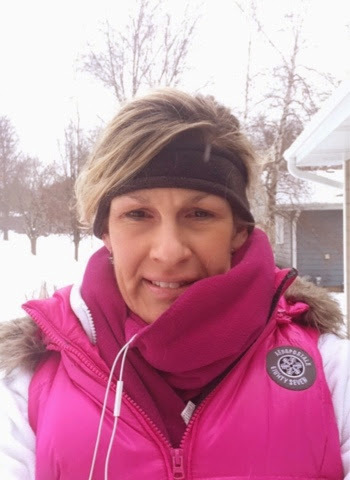 I used to always put the headband under my hair, but last winter I started wearing it over my hair and felt like that kept me warmer because it kept my hair against my neck. If you don't like the feel of your hair mashed against your neck, you can put the headband under your hairline. Your lips will benefit from a layer of lip balm, and your cheeks may appreciate a thin coat of petroleum jelly or (my favorite) Aquaphor to shield them from the wind. A tip for you ladies with long hair...if you put your hair in a braid(s) instead of a ponytail, you'll have less "bouncing and swaying," and it will be much less likely to get stuck in the aforementioned stuff on your face. If you're running during the daylight hours, I strongly recommend you wear sun glasses. The sun may be lower in the sky, but it reflects off the white snow with an almost-blinding brightness. The cold air makes my sensitive eyes water like crazy, so having a little shield from the wind helps them water a tiny bit less. 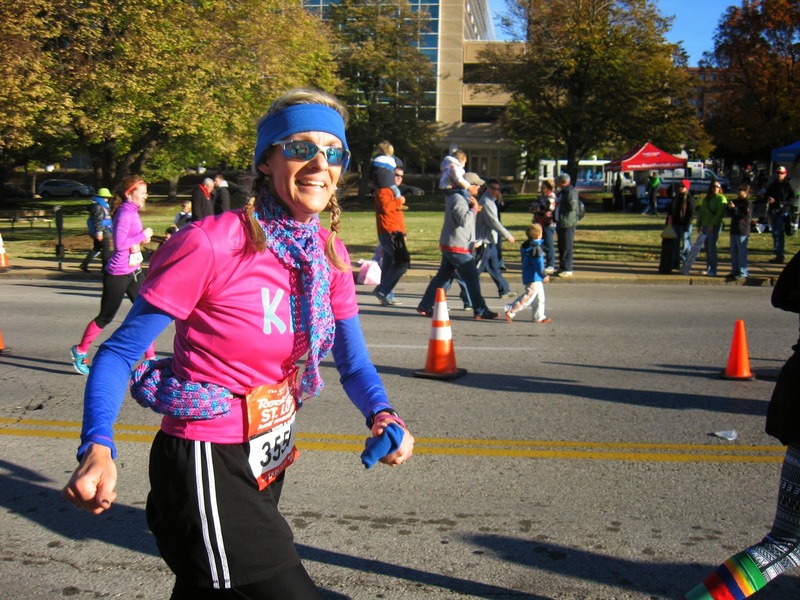 Sunglasses also make you look like a hard-core running maniac (just saying). Don't forget your neck! I'm not a turtle-neck fan, so I usually have a scarf wrapped around my neck. This can also be pulled up over your mouth and nose if it's really windy or cold to help "filter" the cold air as you're breathing. Another option is to wear a cowl, which is like a "short" infinity scarf (or a turtle-neck minus the shirt). Or, you could wear a turtle neck if you're a traditional kind of person. Almost always, I wear a fitted tank top as my first layer and a fitted, flannel-lined long-sleeved tech top as my next layer. The "fitted" fit is key for me because it keeps the warmth right next to my body. If you prefer a not-so-fitted-fit, keep in mind you will feel some cool air circulating around your body if you go with more loosely-fitted clothing. If it's real cold (we're talking below 30 degrees or colder), I will wear an additional long-sleeved top over the fitted top. There are plenty of choices when it comes to outerwear, but I prefer a puffer vest instead of a jacket. 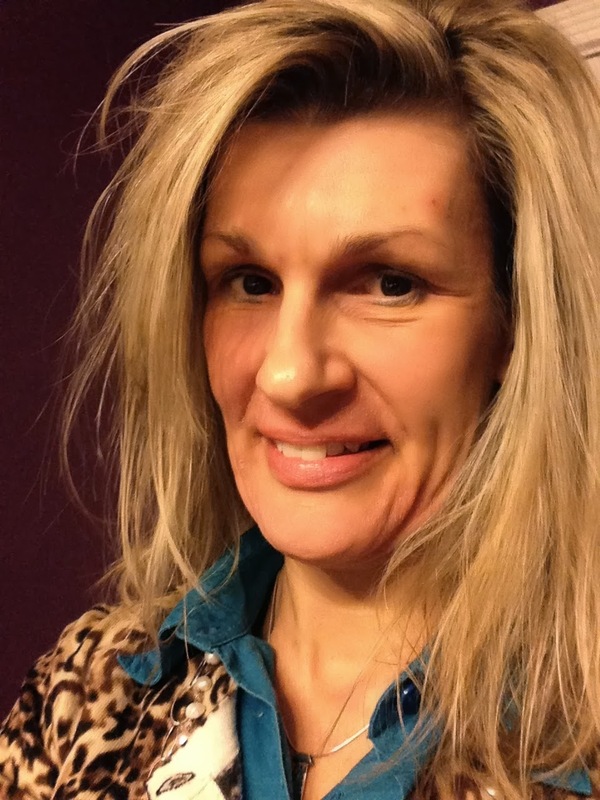 A jacket may keep more of the warmth inside, but the sleeves feel too constraining for me. Also, I'm tall---translation: I have long arms, and most sleeves don't make it all the way to my wrists anyways. Since the thickness of the shirt sleeves is much thinner than a jacket, I'm able to keep them tucked under the edge of my gloves with success. 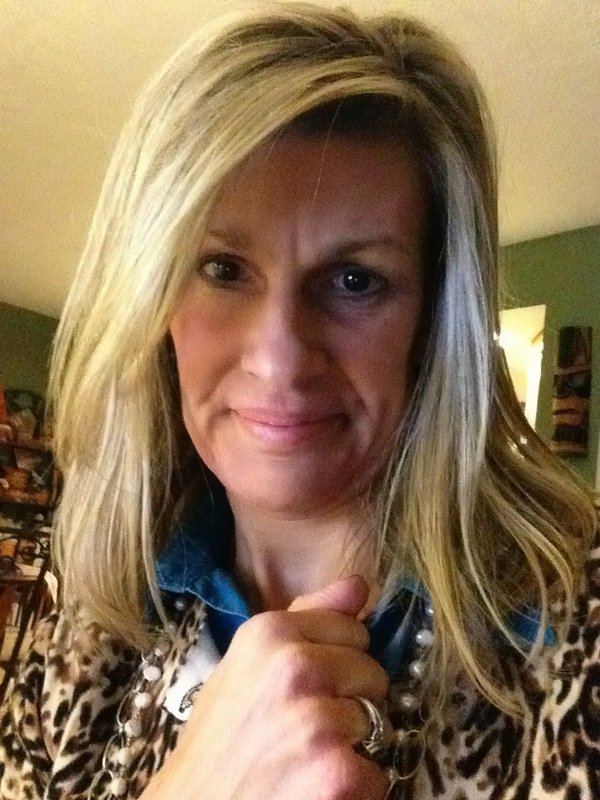 I adore the long-sleeved shirts with thumb holes, too! 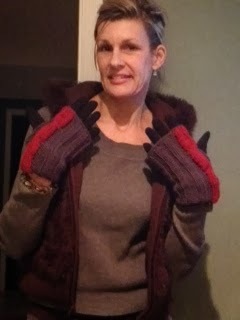 I'm also an avid knitter (ever since childhood...probably (yet) another blog for another time), so I have made a couple pairs of knitted arm warmers that I slip over my sleeves if I need just a bit more warmth on my arms. That's just my personal preference, do what works best for you. Gloves or mittens? In general, mittens will be warmer than gloves, it goes back to the scientific (or is it a mathematical?) principal of surface area. Gloves have more surface area, therefore, their surface is exposed to more cold air than that of mittens. This is not meant to be a lesson in science (or math), so let me just say that after the first 10 minutes or so you probably won't notice much of a difference between them. I sometimes layer a thick pair of mittens over my gloves, then remove them after the first mile or so. I also have a vast collection of knitted wrist warmers (some that actually match my knitted arm warmers), and I sometimes layer those over my gloves (and remove when they're no longer needed). Lots of options, and the possibilities are endless. 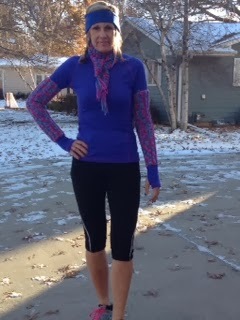 One of the absolute greatest inventions I have come across in my seven years of cold weather running--running tights. 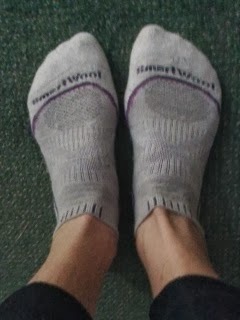 I simply cannot believe how warm they are, and how thin, non-bulky, and comfortable. There are numerous options with tights, too. Some are flannel-lined, some are not. Most come in black, but many companies are now making them in other colors or with patterns or striping. Usually one pair is sufficient, but if there are sub-freezing temps happening, I sometimes layer a second pair of tights over the first layer. I always wear a skirt or shorts over tights, though. I treat them as "tights," not pants. Capri tights are an exception for me... I treat them as long shorts, therefore they don't require a skirt or shorts (that's my logic). If you're not comfortable in tights, you have the option of pants or leggings. It really is a matter of preference with these as well. Personally, I don't like the bulkiness of pants, they seem "heavy and baggy" to me, thus they give me the impression they'll have too much wind resistance and not allow me to run as freely or as fast (that's what I have told myself anyways). What about shoes? I live in Iowa, so there is plentiful snow and cold temps for several months. I just use my regular running shoes, but am cautious of slick surfaces. I don't usually have problems with my feet getting wet because the temps are cold enough that the snow doesn't melt (and I'm wearing wool socks, so it wouldn't be much of a problem if some snow got inside my shoes). I have heard of using duct tape on the outside of your shoes (over the mesh), but have not yet tried to do so. I have also heard of runners putting tiny screws into the soles of their shoes (for gripping), but have not tried that either. I do not own trail shoes, but I have heard they are a great option for added traction. I have wanted to do a Rock'n'Roll event for a very long time. I have wanted to do a destination race as well. Almost a year ago, I started following a fellow runner on Facebook and we became (almost) instant running pals, and I have looked forward to meeting this gal, Fran, for some time. 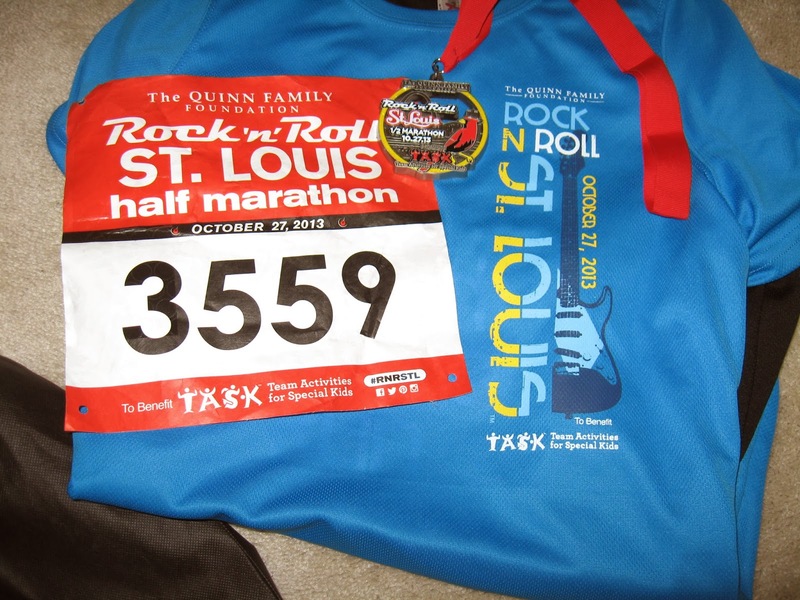 Well, the weekend of October 26th-27th was a grand slam (of sorts), as I got to accomplish all three of these endeavors in the city of Saint Louis! The Rock'nRoll event attracted a lot of runners to the city...and there were a few baseball games happening as well (can you say, World Series?). 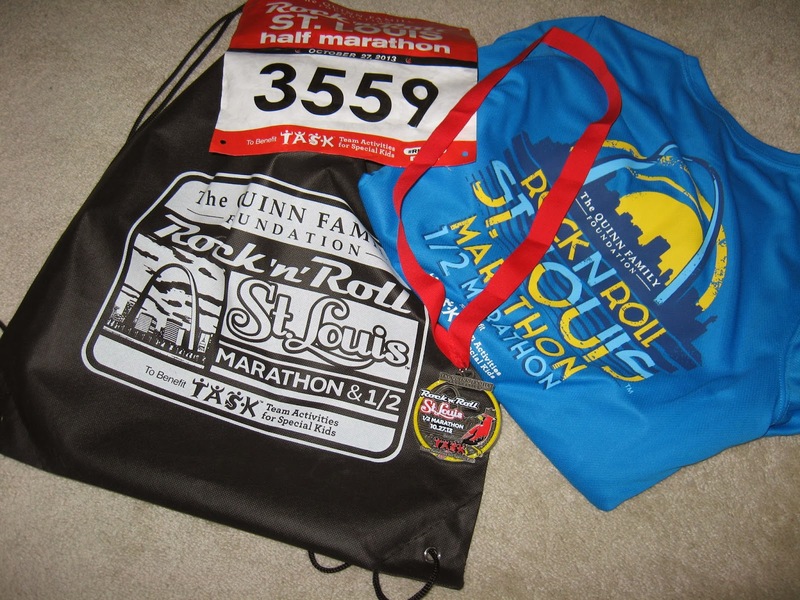 Living in Iowa, the journey to Saint Louis took some planning. 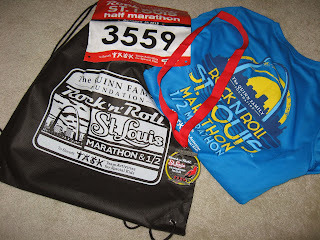 Most of the races I have done have been within an hour or so of my house, not requiring too much travel time. 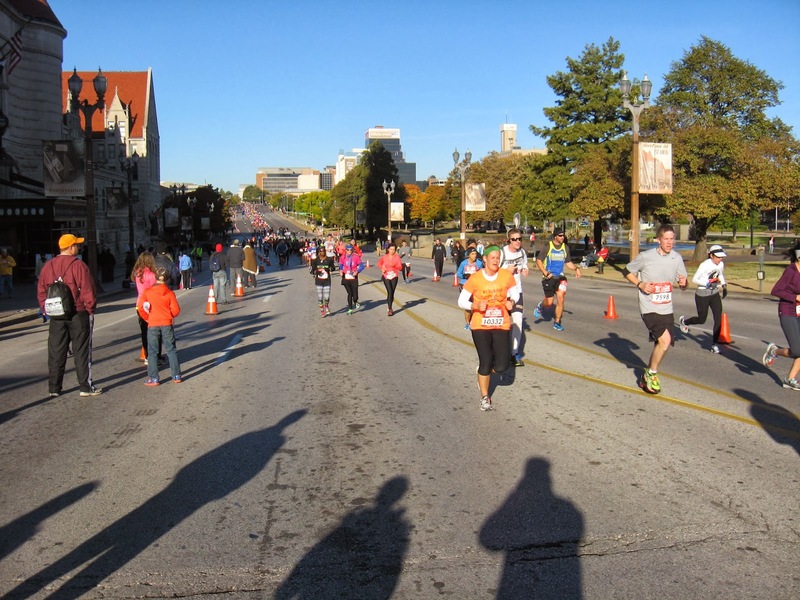 With the exception of the Quad Cities Marathon (which ventured into Illinois through some of the course), all of my races have been in Iowa. Not a bad thing, but I certainly have felt the need to run elsewhere. The drive to Saint Louis from Grinnell took us about five hours. The husband (chief driver extraordinaire) and youngest daughter were my travel companions. We arrived at the expo around 3:30 on Saturday and spent about an hour walking around and checking out the exhibits and vendors. Sunday morning arrived with a 4:45AM wake-up. The temps were in the 40's, so I had a long-sleeved (flannel-lined) tech shirt layered under another shirt. 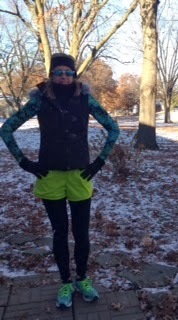 I decided to rock the full-leg tights under the running skirt, and had the arm warmers, gloves and headband ready to go. The husband and daughter dropped me off around 6:00 at Fran's hotel, and they headed off to find a breakfast place. Although Fran and myself had never met in person, we have been Facebook friends for several months...and we instantly recognized each other as soon as I walked through the doorway. A big hug, several laughs and we were talking like old friends. 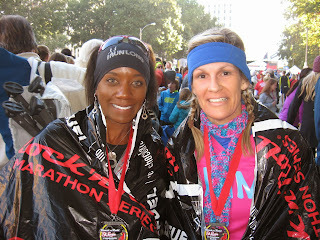 We took a few pics, then headed to the start line. The race was to start at 7:00AM, and at 6:30 it was still dark as night. There were a lot of runners heading the same direction, so we had no problems finding the race course. Our corral got called, and we were off and running. 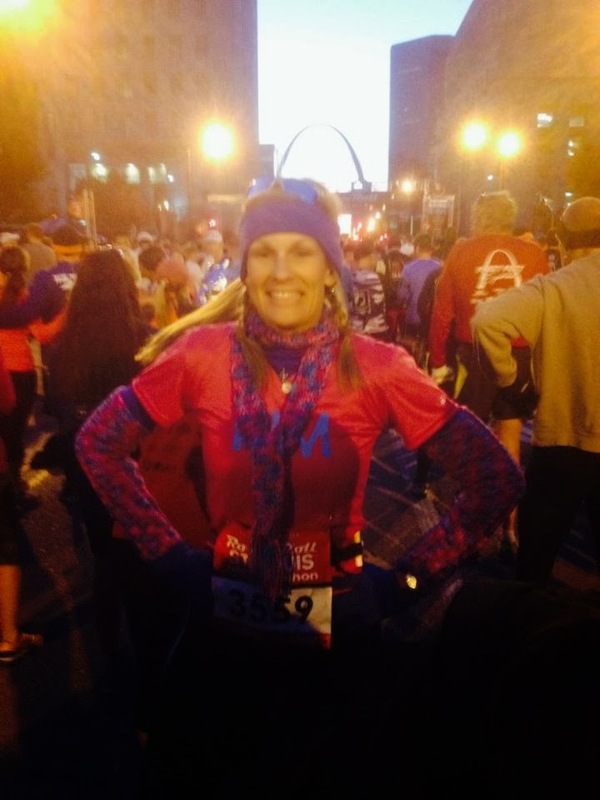 The view from the start line was beautiful, we could see the Arch straight ahead of us and the sky was starting to brighten from the sunrise. As we approached the first mile marker, we could hear a band. This wasn't just a few guys with guitars, but a full band -- complete with a drum set, microphones, speakers and amps. 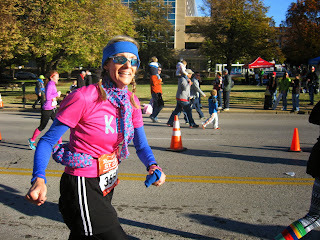 I had started my watch as we crossed the start line, and imagine my elation to see we had run the first mile in 7:15! 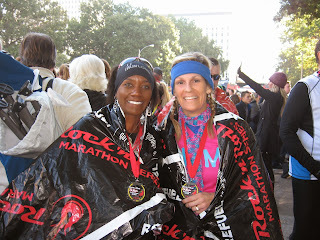 Fran and I had been chatting as we ran, so I hadn't been paying attention to just how fast we were moving. Then I realized my watch was showing the actual time of day, NOT our race time, Duh. Fran is a fast runner, but I don't think even she could get me to master a 7:15 mile. By the time we made it to the second mile, the sun had fully risen and we had complete day light. The crowd of runners remained pretty heavy, but it wasn't too much of a problem. I'm not really a competitive runner, but I do enjoy the race environment. There's something about being in a group of fellow runners, all headed towards the same destination....it is invigorating! I love the shouts and cheers from the spectators, the fun signs, and the echoes of cow bells. Can you see us in the distance? Can you see the shadows of the husband and daughter snapping the pic? 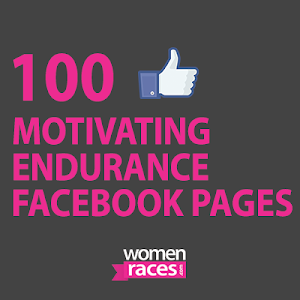 I have done numerous races, several have been with friends or with the husband. It's kind of an unwritten agreement that we all start together, but eventually spread out and each run our own pace and then meet up at the finish line. This was my first time actually running with a friend, talking along the way and not relying on the music from my Ipod to keep me entertained. Here we are, waving to our fan club! We kept a steady pace, just under a 10-minute pace, for most of the race. Quite remarkable, since we were not only chatting for much of the run, but also tackling the constant hills along the route. The hills weren't steep, but they were plentiful. 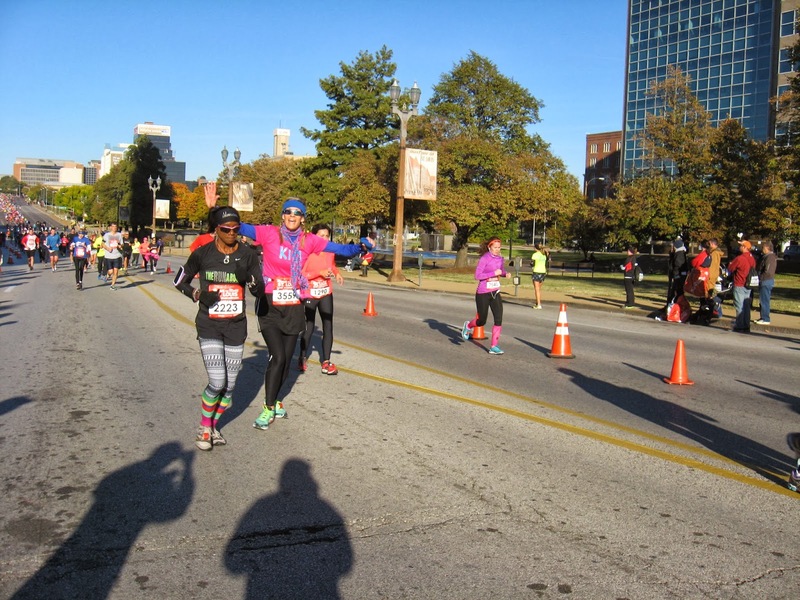 Since my marathon 5 weeks prior, my left Achilles tendon had been a little angry with me, and it was battling me on race day in St. Louis as well. I have wanted to do a Rock'n'Roll event for a long time. 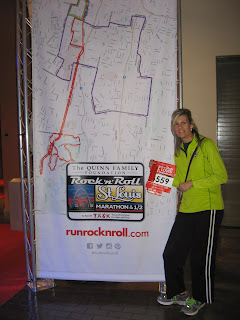 I love running, and I love rock-n-roll music. I also love traveling to big cities, doing a run while there was an added bonus. This was a big event, and there were numerous photographers everywhere. Hopefully, Fran and I kept them entertained with our silly poses! Despite the chilly temps, I was never uncomfortable. 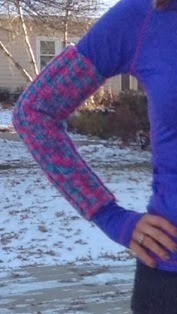 I stripped the arm warmers after the second mile, but the gloves stayed with me for most of the run. The water stations were frequent, so we had plenty of refreshments at our disposal. The bands were great! There was constant entertainment and numerous spectators along the course. We ran through several of the downtown streets of St. Louis, passing Busch Stadium, and ventured through some beautiful historical neighborhoods as well. 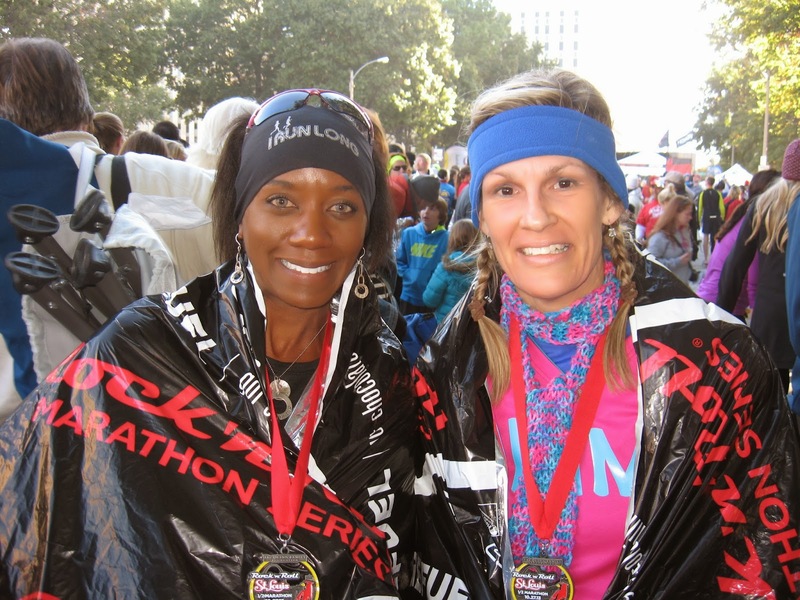 This was my first time running alongside a friend for the duration of a race. Usually, I'm in my own world with my music playing. I love seeing all the spectators along the route and sharing smiles and/or high-5's with them. But running with a friend was so much better. 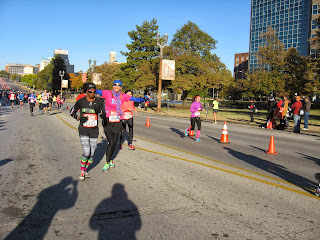 We were talking a lot, laughing at each others' jokes and comments, and getting better acquainted with each other as we conquered the streets of St. Louis enroute to the finish line. Before we knew it, we had left the neighborhoods and were working our way back to the downtown area. Soon, I spotted the husband and daughter. The finish line wasn't much farther. Fran and I rounded the last corner and grabbed hands as we crossed the finish line in St. Louis. No, I didn't play any baseball while in St. Louis, but I did hit my first Grand Slam. Let's hope it's the first of many. 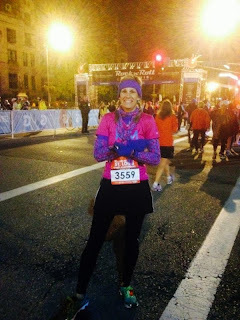 Have you ever wanted to find a quick and effective exercise to enhance your running? Something that won't take but a few minutes a day, but will greatly strengthen your legs, glutes and core? And will make you feel like a beast? What are wall squats? Also called wall sits, these are simple squats where you lean against a wall and hold the position as long as possible. You will feel the bulk of this in your legs (quads), but also in your glutes. As you become stronger and are able to hold the pose longer, you will also start to feel it in your core. We all know leg strength is crucial to running, but glute strength is a very strong second. Having strong glute muscles will enhance the leg strength because both are connected......if both sets of muscles are strong and in working order, neither has to absorb an unfair amount of impact. A lot of runners suffer from problems with their ankles, knees, IT Bands, and piriformis (a muscle deep within the buttocks), as well as a host of various other less painful issues. A lot of these injuries can be avoided, or reduced, by having strong glutes. So, how does one do a wall squat? How long do you need to hold the position? How many reps? The basic wall squat is done by standing against a wall and sliding down until your legs are in a 90-degree position, parallel to the floor. You will want have shoes on (or be barefoot) because your feet will try to slide if the surface is slick. Most people can probably hold this for 15-30 seconds, but try to hold it for as long as possible the first few times you do it to get a "base line." Keep track of this base line, and every time you do the squat, write it down to chart your progress. Try to squat for 10 seconds longer each time you do it. A variation of this, is to squat against the wall and slide down until your legs are at a 45-degree angle. This position will be easier to hold, so you will want to hold it for a longer time to get results. You can also do intervals with this pose and the previous 90-degree pose...alternating between each pose. A more difficult pose is the one-leg squat. Trust me, this is much harder! It not only throws in the element of balancing on one leg but also adds the demand of holding your own body weight while on just one leg. You will want to do intervals with this pose as well. I would recommend starting with intervals of 5 seconds on each leg, and gradually increasing to 10 seconds, then 15 seconds, etc. Try to keep the extended leg out as straight as possible, on the same plane as the flexed leg. If you're up for an even greater challenge, try squatting with a balance ball. This will tap into your core as you not only balance on your legs while squatting but also as you keep the ball in position. Master the one-leg squat with the balance ball and you will be a B.E.A.S.T. Every person will have their own threshold of skill with wall squats. You can do these several times throughout the day (for shorter periods of time), or do one "long" squat once a day. You can have your feet together, shoulder-width apart, or even wider. You can mix these in with other strength training (such as lunges, squats or planks). You will see results with these pretty quickly....probably within a week you'll be able increase your "squatting time" substantially. So, let's get to work! Sit tight, friends!